We will have our weekly forum party on Saturday this week. If you are not sure what a forum party is, it is when forumers get togehter on ESO to play some friendly team games. Everyone is welcome! For more information, visit the Forum Party Thread. Confused about Villager Seconds and how fast a settler gathers a particular resource? Well, Brtnboarder495 made up a guide listing each gather rate for each type of villager. Native Villagers, European Settlers, Settler wagons, Coureur de Bois, and all canoes and ships that can fish/whale are listed. Moreover, Brtn lists all the home city cards that effect gathering and techs that can be researched. To see the full guide and understand a little bit more about villagers, visit his thread. Tired of waiting while Quick Searching or not finding the quite right game in the Game Browser? Well, if you join the Age of Empires 3 Heaven Ladder for The WarChiefs you'll probably get a game within a minute or two on ESO2. The ladder is 1v1 based and it is on-going so you can climb to the top by defeating other HeavenGamers. You can only play the same opponent once every three games so it won't be the same person constantly, every day that wants to beat you. You can read the rules, report games, or sign up in this thread. So whenever you sign on to ESO2 just go to the Chat Browser and create a Chat title "AoE3 Heaven Ladder" if it is not already there and start defeating fellow forumers! Remember, if you signed up for the vanilla (AoE3) ladder, you do not need to sign up again for The WarChiefs Ladder. 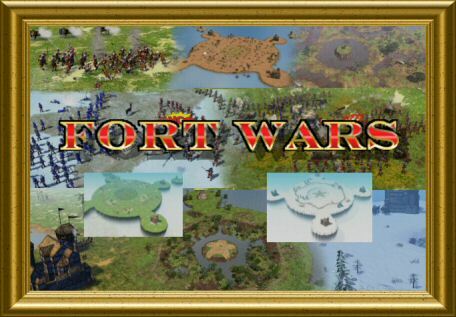 A brand spanking new update for Fort Wars 3.0 was released today by pftq. With it includes over 40 changes and updates! Of course, the most improtant feature is thee are no longer sync errors after playing For Wars. After Fort Wars 2.0 was released there was no need to log out of ESO after playing a Fort Wars game. To download it, visit pftq's site. You can also thank him and discuss Fort Wars here. Tired playing against Spain and expecting one of two things, feeling helpless as Dutch? Well, F1RE_FLY came up with an "Anti-Spain" Dutch Fast Fortress Strategy. The key to this strategy is 10 skirms, 8 pikes, and Ruyters. •Collect 400 wood, make a barracks and a few houses near TC(Use gold and wood villagers for most building jobs in age 2). •Make another batch of skirms. •IMPORTANT: Once your banks are done shift 2 food settlers to coin. This leaves you with 3 wood gatherers, 5 food gatherers, and the rest on gold. •Take your mini army of 10 skirms and 8 pikes to the enemy. •Use the 8 pikes to kill forward towers,TPs (but not ATPs-too strong) and/or houses, as your 10 skirms can one volley kill settlers. For full details of this strategy and more insight from forumers, visit his thread. Ensemble Studios made a Plymouth Map, much like the Winter Wonderland map from last year for Christmas. However, this is for the celebration of the United States' holiday, Thanksgiving! Visit our WarChiefs downloads section for a new festive custom map, Plymouth! The map is a veritable cornucopia of Pilgrims, pumpkins, and envoys. To download some Holiday fun, download it at Age Community's TWC download section and discuss it on our forums. ...just to name a few. To thank Cyclohexane and download the guide, visit his thread. This November 19th we will be having another Forum Party. On Sunday , like every week, a bunch of forumers will meet up on ESO2 to play a few friendly team games. Lots of people show up so 4v4s, 3v3s, FFAs, and Ladder Matches are all possible to play. It's a great time to level up your low home cities or try out a new strategy while playing a game with familiar faces from the forums. For more detail, visit the thread for information and discussing the game afterwards. Anyone who played Age3 around Christmas probably remembers the "Winter Wonderland" special RMS ES released around the Holiday season last year. Ensemble is doing it again this Thanksgiving by releasing a new RMS, Plymouth. Our resident staff Kastor broke the news at our forums a few days ago. From the looks of it the map may be much like the New England map, but with many giant turkeys, vicious black bears, and huge pumpkins around, making it much more exciting if you ask me. We'll keep you posted as to when Ensemble releases this special map, meanwhile you can check out the screenshots and information from Kastor's forum thread. What happened when Age of Empires III's single player campaign characters created a custom chat room on ESO2? Lord_Aaltar has a the conversation log. Alain: why can't we just settle our differences nicely? A bit more than a year since Age of Empires III's release for the PC platform, MacSoft, a company specialized in games for the Mac, has announced that the port of Age of Empires III has finally gone gold. So Mac users waiting to play AgeIII on their macs will soon be able to. To be honest, getting an A and above makes me pretty happy for grades. To read the rest of the review, visit their website. The WCG and Intel have teamed up and announced a massive tournament for The Warchiefs expansion pack with over $8000 worth of prizes, including $1000 cash and a monster of a gaming PC for first place! Why not discuss this great news for TWC with other Age players forums! MNBob, known for always updating his charts for AoE3 and TWC has compiled a list of the three crucial things to know for playing Age of Empires 3: the WarChiefs. He lists all the buildings. That also includes what techs they have, units they make, cost, build time, maximum settlers that can build it, LOS and hitpoints. If you need to find something out about a building, just look there and scroll down until you find the one. Also, for the numerous amount of cards he compiles a table that divides up the civilizations and what Home City building or Tribal Council Chief for quick reference to see what a card does. And finally, the units. What counters what? How much HP does a unit have? What their cost, speed, LOS, range, pop, train time? Ask no further, click, scroll, and be amazed. In a very confusing change, there are now only two units classified as Light Infantry (CoyoteMan and EagleKnight). AOE3 light infantry like Strelets and Skirmishers still have a bonus vs Heavy Infantry but they are no longer classified as Light Infantry. Confusing? Maybe. Make sense now? Yup. Thank you MNBob for consistently updating with every patch. Thank him here or follow the links to his charts. LembasBread, and officer for the [NerVe] clan, has decided to set up a Vent server for the AoE3 Community. It is open to anyone, not just NerVe clan members. If you are unaware of what ventrilo is, it is simply a voice over. You can use it to communicate with teammates vocally during clan battles or forum parties, or you can use it just to chat with other players while relaxing. Either way, it is helpful and enjoyable to have. Lembas will post up the Vent IP soon. For more information, go here. DanishCasanova has posted up a pretty effective Aztec Rush that can let you get to the Colonial Age in under 4 minutes then attack with 10 coyotes followed by spearmen or 11 Rodeleros at around 5 minutes followed by normal troops depending on what the opponent makes. It is a standard Discovery Age, ending with 15/16 villagers. Or, send 300 wood and then 300 coin. There are two strategies in one pretty much so it is your choice. With all the feedback given and great comments so far in the thread, there is at least one of those Build Orders/strategies that you are bound to see fitting for your style of play. To read all of them, visit the Aztec Rush thread on our forums. First up, fragland.net awarded an impressive 85% for the game, citing the new civs, tactics and scenarios as plus points but marking down for the pathfinding, dialogue and the size of the standard UI. The Warchiefs got awarded 7.7 out of 10 from NZGamer.com, commenting: "It's steady as she goes for Ensemble's latest addition." Lastly, a somewhat interesting review from EuroGamer, which awarded TWC 6/10. We will be taking ESO servers offline at 3:00pm GMT (9:00am CST) while we roll out patch 1.01 for The WarChiefs and perform maintenance on the servers. Server down time is expected to be approximately 60 minutes. Thank you for your patience as we work to bring this new patch online. If you have any mods for the game installed, it is recommended that you uninstall them before installing new patches. To discuss the patch once it is released, or bored while the servers are down, visit our forums for discussion. Ensembles' Bruce Shelley has updated his developers blog once more, with news about AoE III, the gaming world in general and the sad news of Matt "Maimin_Matty" Scadding leaving Ensemble Studios to go back to Canada. After graduation he came to work with us full-time and eventually became producer for our ES Live team. He remained active in balance testing all of our projects and was among the best of our players. He made playing an intense RTS look almost effortless. News on upcoming TWC Patch! * Bonus from the Agents card reduced from +200% hitpoints to +50%. * The 8 Spy home city cards for the British and Portuguese moved to the third age from the second age. If you have this card in your deck, the card will be moved to the third age in your deck as well. * Cards that reduce the wood cost of buildings changed to prevent building cost from being zero or negative. * Wallenstein contract now affects the new WarChiefs mercenary units. * Queued shipments from your home city are now removed properly during revolution. * British team animal fattening cards now work as described. * Reduced longbow ranged attack by 2 and hand attack by 1. * Fixed a possible exploit with shipments from team cards. * Fixed several new cards that did not have a shipment cost. * Fixed an issue that caused some users to be stuck on the “Connecting to ESO…” dialog box. * Statistics window rendering fixes. The patch is already in the final testings, it will probably be released very soon. Thanks to Mick from aoe3.de for the heads up. pftq, the main scripter of Fort Wars designed a new "map" called AoE3 Racer. However, it is no simple Random Map, but rather a fun little game to play. Killing nature units will make you faster and the XP you gain will help you level to better units. Every kill gains you 0.1 speed. At certain levels of XP, you will transform into a Halberdier, then Hackapell, then Nootka Warchief, and finally an all-powerful Learicorn. Do whatever it takes to get to the Llama first. Skip all nature units if you wish. Poke each other to slow each other down. Find holes in the wall to sneak your way through. Anything works! So enjoy the change of pace and challenge a few of your friends. You can download AoE3 Racers at pftq's site or here in our Download Section. To discuss AoE3 Racer, comment in pftq's thread. WarChiefs lives up to its role as an expansion pack: rather than shake up the core game, it manages to offer up enough enhancements to make it interesting. Highly recommended for multiplayer, less so for the single-player campaign. jaafit, the author of countless great Dutch strategies such as the Skrim Skewer, The Bank Spank, Dutch Gren Rush, and Make Banks in Discovery, has posted up yet another Dutch Strategy involving getting a couple banks up quick and 8 pikeman by 4:30 with a 21 settler economy. It is quite simple and, as always, he lays out an easy to follow Build Order with tips and suggestions on how to be successful. As soon as the 1st bank is done, you can ship 8 pike. 8 pike arrive and you go to town. Do whatever you can with those. Get the port's 2nd TC, kill the Otto's forward rax, get germany's TP down or if you're fast enough, kill iroq's foward war hut (tough to do!). There is plenty more where that came from. It is straight and to the point. And best of all, a recorded game is provided. So, if you feel like taking a break from agent massing, try The Bank Rush. Another day, another review for The Warchiefs. This time it is Gaming Horizon's turn to critique the expansion pack, giving it a score of 8.0 out of 10. Amongst other things the varied campaign objectives were mentioned in the review as one of the games main plus points.